Lurbuk is an Orc bard found at the Moorside Inn in Morthal. Jonna claims that the only reason she hasn't booted him out is because there aren't any other customers for him to bother. A contract on him is offered in the Dark Brotherhood questline. 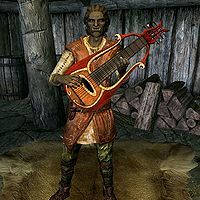 He is called the worst bard in all of Skyrim, with Nazir noting that Astrid had to draw lots on which contract to answer because there were so many of them. He wears a set of farm clothes along with a pair of boots. He carries some common loot and gold and an iron mace. Lurbuk seems to talk in rhyming verses, in normal conversations with him. "Shadows creep, and... and phantoms leap! A man got... he got scared. And the demons dared! To um... visit upon him all which they feared!" Jonna: "Oh, I shouldn't be surprised if they come 'round. And if you're never seen or heard from agin [sic]." Additionally, Jonna may greet you with: "I've tried to explain to Lurbuk that his "singin'" is gonna get his throat cut." According to the game data, Lurbuk is the son of Chief Burguk of Dushnikh Yal. 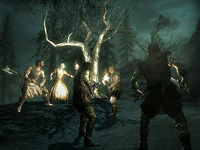 If Lurbuk is killed before the quest to do so, a letter is received from Burguk essentially thanking the player for killing Lurbuk. Killing Lurbuk inside his room at the inn may lead to his body disappearing then reappearing on the floor in front of the bar. ?